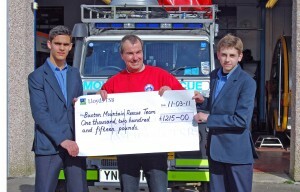 Two young men from a school in Dunstable, Bedfordshire have just raised a staggering £1,215 with a sponsored cycle ride. The event was part of coursework in Citizenship for GCSE. (news article 15/11/10) The coursework involved researching an organisation and then preparing a presentation to their peers. Another aspect was to attempt to raise money for the charity and the lads embarked on planning a sponsored cycle ride through the Peak District. The event was on a soggy November day last year but that didn’t dampen their enthusiasm for raising money. Four months on and with all the research and paperwork done there was just one last presentation to make. Last week Fraser Denny and Glenn Hibbert visited the team’s base in Dove Holes and handed over the giant cheque to Team Chairman, Roger Bennett. 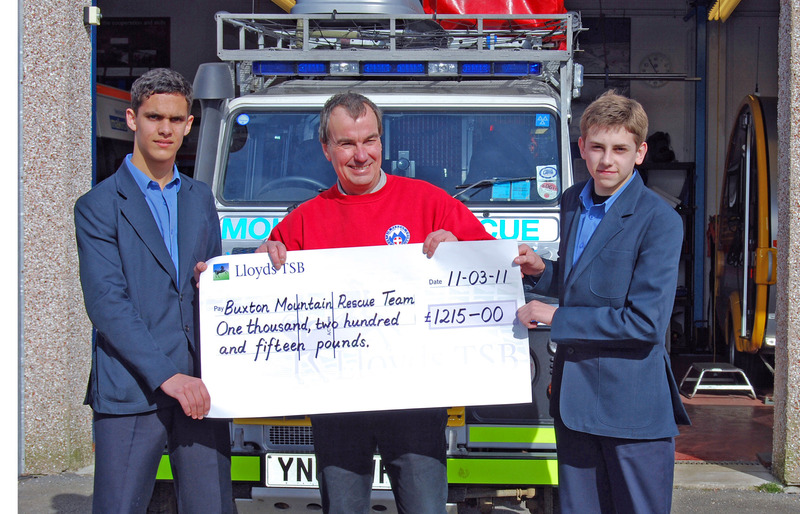 The team has had many enquiries from students researching BMRT for their school coursework but this is by far the biggest donation that has resulted and the value was a complete surprise. We send a huge thank-you to Fraser and Glenn and hope their exam results are as good as their fundraising results.